The International Advisory Forum “Cultural Routes” of the Council of Europe will be held in Chania from 7 to 9 October 2020. At the second meeting the first guidelines and schedules for the forum, were discussed and set. At the meeting were present representatives from the Hellenic Ministry of Culture and Sports: Mrs. Marianthi Anastasiadou, Head of the International Relations Department of the Directorate for International Relations and European Union, Mr. Fotis Vlachos. Also the member of the Department of International Relations, Ms. Athanasia Zotou, who represented the Region of Crete, the Deputy Mayor of Chania Mr. Kyriakos Kazakos, the representative and member of the Board of Directors of EBEX Mr. Spyros Papakastrisios, the secretary of EHICA Mr. Antonis Thimakis and the Founder and President of the European Historic Cafes Association Mr. Vassilis Stathakis. At the meeting was unanimously reaffirmed the commitment of all parts to cooperate in order to proceed with the timetables of the above-mentioned international advisory forum. 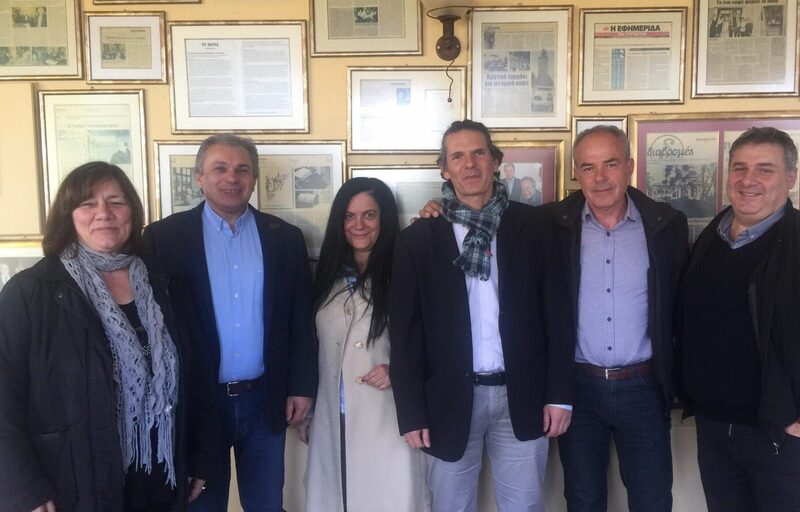 Also, at the second preparatory meeting was presented a Programming Agreement between the Forum Co-organizers (Region of Crete, Municipality of Chania, Chamber of Commerce of Chania), which was jointly accepted by the co-organizers, where the obligations of each party are explicitly described. The idea of hosting the Forum, which will eventually be held in Chania in 2020, was held by the Association of Historic Cafe Europe. In September 2017, at the annual “Cultural Routes” forum held in the medieval town of Luca, Italy, Vasilis Stathakis, (invited as the founder and president of EHICA), discussed with the President (at that time) of the Enlarged Partial Agreement Of the Council of Europe, Mr Alfredas Jomandas and the executive secretary of the Council of Europe’s Enlarged Partial Agreement on Cultural Routes and Director of the Institute of Cultural Routes Mr Stefano Dominioni, the idea to host the forum of “Cultural Routes” in Chania in 2020. The first responses were encouraging, but there was a lot of work to be done to achieve such an important goal. Vasilis Stathakis has begun immediately contacts with the Region of Crete, the Municipality of Chania and the Chamber of Commerce of Chania, from from the very first moment showed real interest and helped in every way the effort. Always in direct cooperation with the Directorate and the Department of International Relations and European Union of the Hellenic Ministry of Culture and Sports, the application file and the video of the Greek candidature were created. The presentation of the Greek candidacy was followed in Luxembourg. Against the Greek candidacy of Chania there was the strong candidacy of Georgia. The Greek candidacy eventually won the impressions and the hosting of the Forum of 2020. The forum is linked to the European Historic Cafes Association, and to the Historic Cafe “Kipos”: Vasilis Stathakis as Founder and President of the Historic Cafes Association has already begun the process of creating a dossier in order to make a new “Cultural Route” the Route of the Historic Cafes , always with the collaboration and assistance of the Directorate and the Department of International Relations and European Union of the Hellenic Ministry of Culture and Sports. The Greek Minister of Tourism, Mr. Elena Kountoura, honored the Press Conference with her presence. It is worth noting that the Council of Europe’s International Advisory Forum “Cultural Routes” is an extremely important forum and more than 55 CoE member states participate at it.